360Intra is a powerful energy booster that will keep you energized and fueled throughout the day for optimal gym results and general well-being. 360 CUT this time is bringing 360INTRA – or should we call it – fuel for your daily energy recharge. This product's formulation is really simple: it will push you body to work harder and take your workouts to a whole new level, day after day. You will be back at the gym quicker than you used to because you don’t need as much time to ideally recover. Needing support on your most grueling training days? 360INTRA will keep you going strong so you won’t ever have to let up or hold back. It also takes care of keeping your body hydrated throughout your workout. Did we mention it mixes easy and tastes great as well? 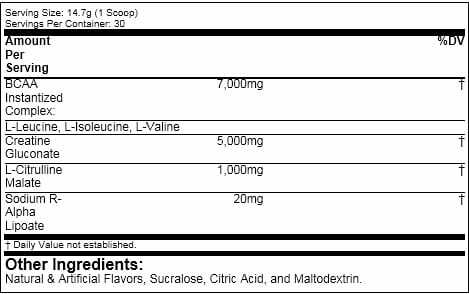 Take 1 scoop with 8-20 oz. of water before your daily workout. Only persons over 200 lbs. can take 2 scoops or more. Consult with a healthcare professional before using, and specially in case of adverse effects. Do not use if you have a history of any medical condition. The same goes if you're taking any medicine, pregnant or nursing. Product can't be used to diagnose, prevent, treat or cure any condition. Not for the persons under the age of 18. How does it help to your body? BCAA, which stands for Branched Chain Amino Acids, is mostly made up of L-Leucine, L-Isolencine and L-Valin. These are seen as key sources of muscle fuel, strength and endurance. These amino acids are usually seen in most fitness supplements on the market these days because they reduce muscle catabolism, build strong muscle tissue, keep the integrity of muscle fibers, and reduce their aging. They also keep fatigue at bay. It will keep your muscles lean even if you are on your non-training period. Creatine Gluconate improves athletic performance, make you more durable, reduce gastric issues and prevents bloating. The L-Citrulline Malate in 360INTRA reduces muscle fatigue and fill your body with energy by producing nitric oxide, which improves circulation health. Sodium R-Alpha Lipoate is a natural substance that can be found in multivitamins and anti-aging supplements. Besides helping regulate blood sugar, it also has benefits on metabolism and cellular energy production. The very first day I used this it kept my energy & endurance up enough that I was able to hit a new deadlift PR – 50lbs over my previous! Taste great, mixes well. I HIGHLY recommend! This product is awesome and will deliver the results you are looking for! The taste is one of the best I have ever used. I will definitely be coming back for more. Looking for a clean boost that will help you get through your workout , then look no further then 360intra, I love using it during my hit days as it delivers an amazing pump without the jitters that other stims give me and the creatine gluconate doesn't leave me feeling bloated like other brands, not to mention grape tastes absolutely incredible! I can not get enough of these bcaa ! 360INTRA by 360CUT will make you feel full of energy that will seem to last forever. 360INTRA is one of those products that, when taken throughout the year, will make it easier for you to achieve the fitness goals you're aiming for. You will always be ready for training without fatigue and muscle weakness. It can also help enhance your exercise and handle stress. 360INTRA improves the health of your muscles and regulates many other functions in your body. It is nothing but smooth, clean and long lasting energy. Order 360INTRA Now For Just $34.99! Ammo-8 Review: Locked And Loaded? REBAAR Review: Is ThisThe Best Deal For BCAAs? Made Man 360 Review – Nutrients Are All You Need! Duramino Review: The Best Tasting BCAA On The Market?